David Hartley's fiction has enjoyed various publications in numerous places including Ambit Magazine, Black Static, Structo Magazine, Shooter Lit Mag, The Alarmist and two Boo Books anthologies; After the Fall (2014) and We Can Improve You (2015), as well as a multitude of websites. His first love was flash fiction, and he touts three collections of the things in the form of Spiderseed (Sleepy House Press, 2016), Threshold (Gumbo Press, 2013) & his twisted Christmas collection Merry Gentlemen (Kindle, self published, 2014) where anti-Santas stalk children, fir trees steal humans for display and the Virgin Mary asks what in hell she is supposed to do with the divine placenta. He is really rather proud of the Christmas collection. 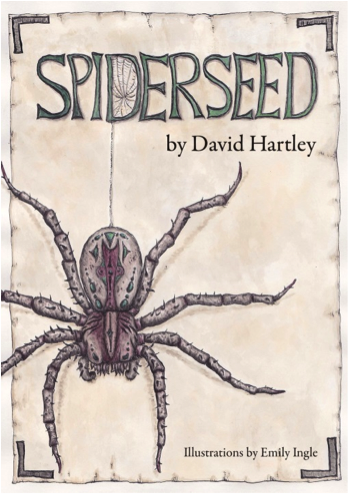 His 2016 collection Spiderseed came first runner-up at the Saboteur Awards that year and copies are still very much very available via his website. Head to the Kindle for everything else. Last year, Hartley started a Creative Writing PhD at The University of Manchester which sees him attempting to write a novel alongside a critical thesis about the place of autism in science-fiction and fantasy. As the brother to an autistic sister, autism has always been of keen interest and Hartley's work-in-progress combines biographical reflections of his life as a sibling of the condition with a wild and weird vision of a bizarre afterlife. The point is try and do something new with the 'autism genre', which he believes has become very stale and, in some cases, quite harmful. Hartley very much believes in the creative power and potential of the autistic point of view and is discovering that it has a particularly unique connection with the weird and fantastic. He would very much like to encourage people reading this bio to get in touch via @Fantastic_Aut on twitter if they have anything to contribute. Beyond the PhD he is also still trying to put together a short story collection about animals, his other thematic preoccupation. His story for Shadow Booth is just another in a long line of horrible tales about animals in bad situations. He has previously placed a rabbit in a time-travelling hutch, a fox in apocalyptic suburbia, and an elephant made of acrobats on the end of a very large gun. In real life, he's much kinder to creatures great and small living, as he does, among a menagerie of rabbits (2) and guinea pigs (9, at the time of writing). He has been vegan for eighteen months and takes it very seriously thank you very much. Please remember to show your support! The Shadow Booth: Vol. 1 is still available to pre-order on our Kickstarter page here, alongside pre-orders of Vol. 2, T-shirts, signed books and many other rewards.